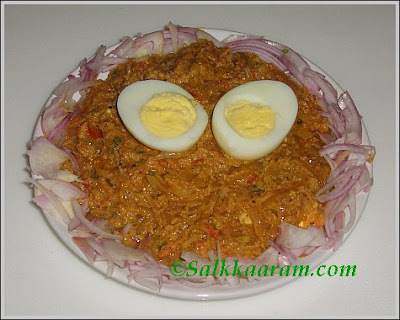 Chettinadu Egg Roast | Simple and Delicious ! Would you use home made masala powders for cooking? I always prefer making powders like garam masala, pepper powder etc at home. For other powders like coriander, chilly and turmeric, we mostly buy whole spices from the market, clean, dry in sun and send them to the mill. It would last long, so we shouldn’t be worried for at least six months. Yesterday, I made some chicken curry using a different garam masala powder, the taste was unusual as one of my readers said – She used sajeera instead of jeera and felt a “strange” taste – I didn’t feel like it is a chicken curry , there was no smell of cinnamon and clove. Any way I decided not to use any other powder if I don’t have the one I usually make. Better I should use the whole spices instead. This Chettinadu Egg Roast is one I found from an old magazine clipping, which is a nice thick curry goes well with chappathi. De shell eggs. Cut into halves. Blend coconut very well in enough water to get thick solution. Grind garlic, ginger,green chillies and fennel seeds together. Heat oil in a heavy bottomed pan, saute onion until transparent.Then saute with the ground paste. After 2 minutes, put tomatoes,curry leaves and all the powder except pepper powder.Add salt. Stirr until the mixture is thick and tomatoes are cooked well. Add blended coconut solution, pepper powder and coriander leaves. When it boils put egg pieces, continue cooking for a while. When the mixture becomes thick, check salt and remove from fire. This is a spicy preparation.If you like to get to a nice red color, use kashmiri chilli powder.Reduce spices according to your taste. This is nice, and I like the use of fresh spice powders. We don't have the luxury of getting spices ground in bulk in the mill... but the small portions do work well. Wow Wow!!! I simply loved the egg roast. Great work! Also visit my blog and let me know ur suggestions! I too make spice powders especially garam masala at home..This thick gravy looks yummy and can understand how different is a chettinaad masala. I sometimes make my own garam masala powder. This roast looks so yummy. I make garam masala fresh,rest of the spices are store brought. 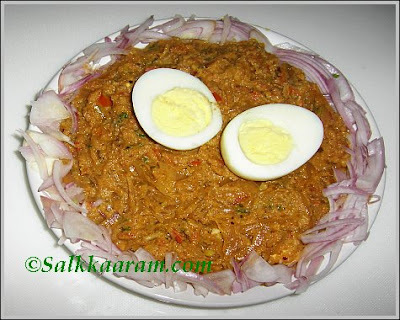 Masala Egg roast must be finger licking good with parathas. I like chettinad cuisine. Where are you now? Still with mom? Looks nice! The colour of the gravy looks great. Nannayitundu keto :) I was planning to make Nargisi kofta:) Ithu kandittu plan mattaan theerumanichu:) Vanitha magazine recipe aano? we added quarter cup of milk towards the end. it helped the masalas blend well.